Feel free to browse this website for many resources, articles, podcasts, and videos related to the book. You can also visit my author website at https://davidkrueger.org/. Last week, my family and I traveled to Minnesota for a combination book tour and vacation. Flying across the country with young kids is no easy feat, and it is important to make sure you have all the necessary supplies i.e. diapers, favorite toys, etc. I’m particularly grateful for the brick of wet wipes my wife stuffed in the diaper bag at the last minute. They came in handy cleaning up the mess from our one-year-old vomiting four times (yes, four times!) in the rented car seat. Although motion sickness is a common ailment afflicting my side of the family, I think it might have been exacerbated by an overindulgence of pizza and (slightly) expired birthday cake on the plane. The day ended a bit more smoothly than it began as my wife and I were able to attend my twentieth-year college reunion. It was great to see many old friends and I was honored to provide a copy of my book Myths of the Rune Stone: Viking Martyrs and the Birthplace of America as a reunion door prize. Although I’ve lived in Philadelphia for most of twenty years, we make it a priority for our boys to spend time with their Krueger grandparents, aunts, uncles, and cousins who still live in Minnesota. It is also good to be back on the farm where I grew up. I love watching the sun rise over the vast soybean field visible from my parent’s picture window. After spending some time Sunday and Monday with the relatives, my wife and I left the boys with my sister and traveled on Tuesday to St. Cloud, where I spoke to a group of students and faculty in the history department at St. Cloud State University. I was invited by Mary Lethert Wingerd, a well-respected historian of Minnesota who wrote a blurb for my book. She is teaching a seminar this semester on public history and wanted me to talk about the Kensington Rune Stone in terms of a civic monument that both commemorated the deaths of Minnesota’s pioneer settlers during the Dakota War of 1862 and legitimated white claims to a landscape once occupied by someone else. It was a great experience to talk with people who had actually read the book and engaged its ideas critically. Students and faculty from from the history department at St. Cloud State University. My wife and I enjoyed an evening at the St. John’s Abbey Guest House. It is relaxing and peaceful environment and the location of a number my writing retreats in the past. In fact, my chapter on the Catholic interest in Viking origin myths was written, in part, on the St. John’s University campus. On this visit, I serendipitously met the granddaughter of one of the rune stone enthusiasts I had written about in the book. I apologized in advance if she took offense to what I said about her late grandmother. As historians, we often think we are safe writing about people who are dead, but we have to remember that we still may have to contend with their descendants! On Wednesday, we ventured down to St. Paul where my first stop was to have coffee with one of the peer reviewers of my manuscript, Jon Butler, a former Yale University professor and perhaps one of the most recognizable names in the field of American religious history. It was great to swap stories about our experiences of growing up in rural Minnesota. Both of our fathers were farmers! After talking with Jon, we made our way to the Amsterdam Bar and Hall for a quick dinner and then proceeded to Subtext Books for my scheduled book talk. In addition to many book store patrons, several of my high school friends showed up as well. We had a robust conversation about the role that myths play in human life and what the rune stone story reveals about the anxieties, aspirations, and values of Minnesotans. [Podcast forthcoming]. While my friends gathered for drinks after the book talk, my wife and I made the two-hour trek back to Alexandria to relieve my sister of child care duty. She got to enjoy an abundance of “auntie time” with her two active nephews and I think she was finally ready to get some rest! First thing on Thursday morning, I made my way to the KXRA radio station for a live interview on a popular local talk show. That evening, I spoke at a book event sponsored by the Douglas County Historical Society. It was held at a senior living facility and was attended by a very eclectic crowd: a combination of die-hard rune stone enthusiasts, local historians, public school teachers, clergy members, former high school classmates, members of my family, and other concerned citizens who wanted to know what this hometown boy was going to say about the town he left behind. Many of the questions centered on the authenticity of the Kensington Rune Stone rather than the cultural phenomenon enveloping it. If you listen to the recording, you can hear one Viking enthusiast pelting me with questions. He later told me that through a divination ritual known as dowsing, he had discerned the exact names and burial locations of the Norsemen he claimed had visited Minnesota in 1362. Despite the digressions into pseudoscience, I was impressed that so many locals were willing to think critically about an origin myth that has defined the community for decades. Although I enjoyed many of the parts of the book tour, I think my favorite events took place on Friday. I left early in the morning for a long drive to Minneapolis where I was interviewed by philosopher Peter Shea for a cable access TV show called “Bat of Minerva” (a Hegelian reference). The hour-long interview is scheduled to air on a future Sunday morning at 12 am. If Minnesotans are not already asleep by that time, it is quite likely that this rather slow-paced interview with me will help them get there. 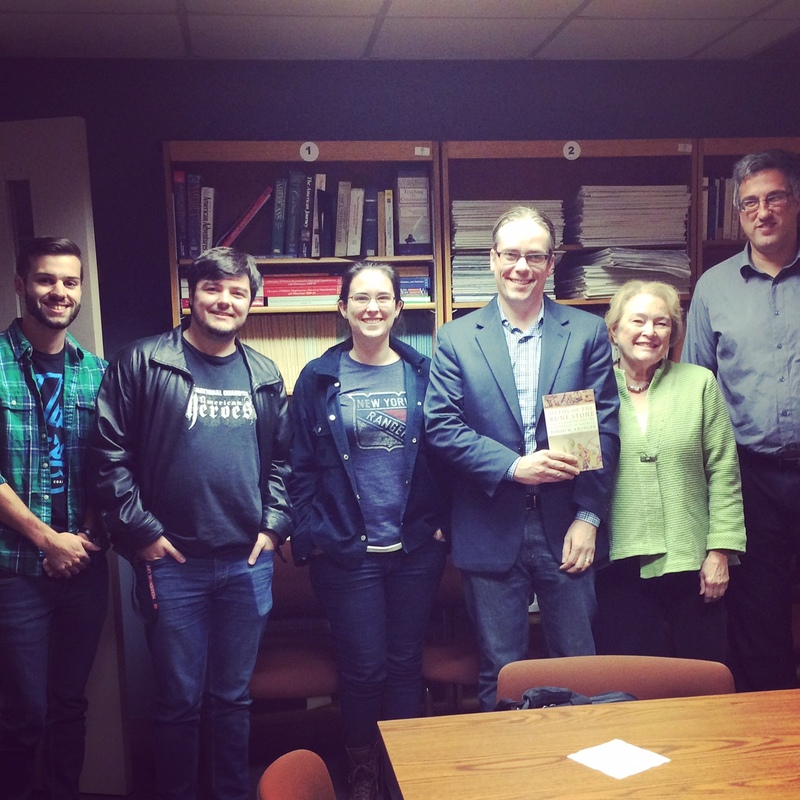 Following the interview, I gave a lecture on my book at the Institute for Advanced Study at the University of Minnesota. If you watch the video below, you will hear some really great questions posed by graduate students, faculty, and other scholars interested in multidisciplinary research. We had a great conversations about the distinctions between history and myth, and the relationship between religion and science. I’m especially grateful that Jeanne H. Kilde, chair of the religion department, and several prominent historians who were in attendance. Finally, in the video, you will notice an attendee who posed several questions about why I do not consider the Kensington Rune Stone to be authentic. That person is none other than Scott Wolter, a History Channel celebrity and host of America Unearthed. Wolter is surely the most well-known and controversial figures in the rune stone story. His research methods have been criticized by many in the scientific community, including one of his former research partners. Yet, his fantastic theories about the Knights of Templar traversing the North American wilderness in the fourteenth century have piqued the interest of millions of Americans who yearn to imagine a pre-Columbian America populated by more than just Indians. You’ll have to read my book to learn more about my thoughts on the tradition of myth making in American history. The event at the U of M was the last of my book tour for the week and I dedicated Saturday to family activities before we headed to the airport on Sunday morning. It’s a good thing we brought along extra wipes for the return trip, because, as you probably guessed, an affliction of motion sickness struck again. I couldn’t have been happier to return the car seat to the rental company. There is only so much cleaning one can do with wet wipes.